Objective: To evaluate the mechanisms of failure after laparoscopic fundoplication and the results of revision laparoscopic fundoplication. Background: Laparoscopic Nissen fundoplication has become the most commonly performed antireflux procedure for the treatment of gastroesophageal reflux disease with success rates from 90-95%. Persistent or new symptoms often warrant endoscopic and radiographic studies to find the cause of surgical failure. In experienced hands, reoperative antireflux surgery can be done laparoscopically. 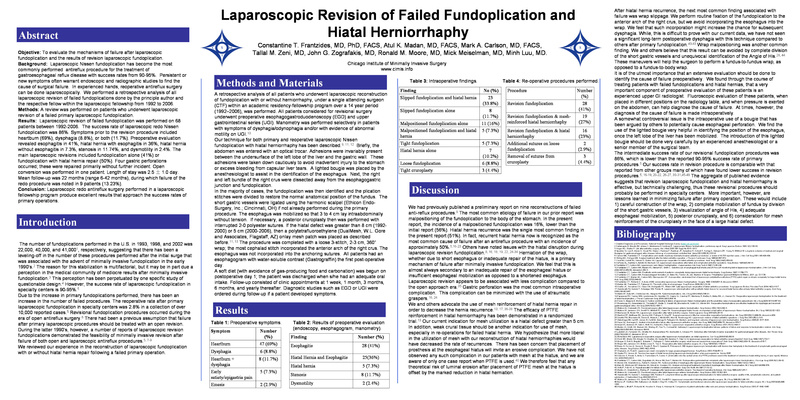 We performed a retrospective analysis of all laparoscopic revision of failed fundoplications done by the principle author and the respective fellow within the laparoscopic fellowship from 1992 to 2006. Methods: A review was performed on patients who underwent laparoscopic revision of a failed primary laparoscopic fundoplication. Results: Laparoscopic revision of failed fundoplication was performed on 68 patients between 1992-2006. The success rate of laparoscopic redo Nissen fundoplication was 86%. Symptoms prior to the revision procedure included heartburn (69%), dysphagia (8.8%), or both (11.7%). Preoperative evaluation revealed esophagitis in 41%, hiatal hernia with esophagitis in 36%, hiatal hernia without esophagitis in 7.3%, stenosis in 11.74%, and dysmotility in 2.4%. The main laparoscopic revisions included fundoplication alone (41%) or fundoplication with hiatal hernia repair (50%). Four gastric perforations occurred; these were repaired primarily without further incident. Open conversion was performed in one patient. Length of stay was 2.5 ± 1.0 day. Mean follow-up was 22 months (range 6-42 months), during which failure of the redo procedure was noted in 9 patients (13.23%). Conclusion: Laparoscopic redo antireflux surgery performed in a laparoscopic fellowship program produce excellent results that approach the success rates of primary operations.